This week I discovered another world less than forty kilometers from home. 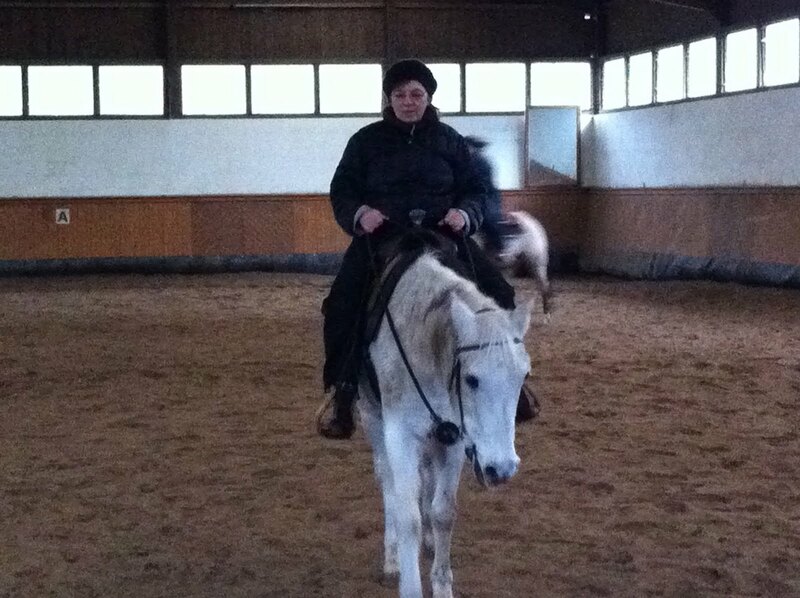 I went horse riding! Nicole, an old friend of mine, invited me to discover her new world, and paid for a lesson at the ranch where she takes lessons and keeps her horse. I hadn't been on a horse since our family had a reunion about fifteen years ago, and some of us went on a little trip in a horse procession, one following the other, snailing through the woods. That was kind of fun, but what would it be like to be on a horse under someone's tutelage - for a whole hour? Getting there was a bit of an odyssey itself. Forty kilometers doesn't seem like much of a distance - about thirty miles, but there is no freeway between here and the hamlet of Ente, where Nicole's ranch - Pferdeanlage Sommerberg - is located. Getting there, you have to drive through the beautiful wooded hills and farmlands of Bergisches Land. Someday I must write about Bergisches Land, one of my favorite parts of Germany. But I had no time to admire the scenery. I was in a hurry to get there - I gave myself half an hour for a trip that I discovered normally would take nearly an hour. I speeded whenever I could, braking at all the speed traps, just in time. I skidded into the parking lot, fifteen minutes late. No time to look at what is advertized as one of the most beautiful ranches near Cologne. But when I walked into the stable, it felt like time had stopped. I found a pretty girl in the stable, and asked her if this was where Nicole's horse was. Yes, she said, Nicole's in the riding hall with her horse. We walked together into the hall. On the way, in, I noticed that the air was cold - just a few degrees above freezing, but at least it wasn't raining. We found Nicole walking her horse at the far end of a large hall, and we waved in greeting. The girl took me back to the stable. "So you want a lesson?" Well, yes, that's part of what I was there for. We walked to a stall where a muddy white horse was standing in a pile of mud and straw. "This is Flasko," she announced. "Would you like to brush him?" I hadn't expected to brush a horse. I thought I would just climb onto one. But everything takes time here. And brush him? I had no idea how to brush a horse. "I'll show you." She took a brush from a basket and began to briskly brush off some of the mud. How did he get so muddy and wet? I began to tentatively brush him. "You can really push that brush into him. He likes it," Leah said. OK. I put a bit more elbow grease into it, and she approved. Next we had to clean his feet. He had no metal horse shoes on - I had to scrape his feet. I was afraid of hurting him. But Leah scraped away, as if she were taking all the dirt off a potato, gouging out the eyes with deft swoops. She showed me how to saddle Flasko. Finally we were ready to go into the riding hall. Another woman was waiting there - Marion, my instructor. "Have you ever been on a horse?" she asked. She led me over to Flasko's left side, and told me to put my foot in the stirrup and climb over. I got my foot into the stirrup, but there was no way I could get up onto that force. I'm too old and too short to swing myself onto any horse. "We'll have to get a ladder for you. Where's there a ladder?" No ladder anywhere. But there was a chair in the corner. Marion brought the chair over and I tried with the chair. I still couldn't get onto that horse. I was thinking that this would be the shortest lesson she had ever given. Nicole walked over and held the saddle down on the other side. Finally I was able to sort of shimmy onto the horse. Thank goodness no one was photographing me, because I did not look graceful. And then I began to ride. At first Marion led Flasko around with a rope, as I learned to click and dig my heels in, the signal to start, and then to pull on the reins, pull my heels up and say, "Whoa!" Sometimes I had communication problems with Marion. I have never used the German words involved in horseback riding. But after a while, I got it. Not only did Flasko have to be trained - his rider needed it too. But soon Flasko actually stopped at "Whoa!" and started after my clicks, especially when I dug hard into his sides. After a few rounds of this, she showed me how to steer. To turn left, I just had to dig my right heel into him and turn my body left, holding the reins toward the left. She set up a slalom for me with plastic cones. Flasko and I managed to do the slalom pretty well. "Now we'll try some trotting," said Marion. I felt a little panic rise. What if I fell off the horse? "Don't worry. I'll lead with a rope. Nothing can happen." Before long, we were trotting. Bounce, bounce, bounce, went my body. But Marion and Nicole both said that I looked good. This was fun! We were getting some speed here! Marion took off the rope, and we continued to trot around the hall. The hour was done. It had gone quickly, and it was a lot of fun! "Now I have a job for you," Marion said. "There's a girl here who wants to go to America on an exchange program, and she brought her application with her. Could you just go over it and check for mistakes?" Of course I could. I was quickly finished, and then the girl, another Leah, walked in. We drank tea and the group of us chatted for a while. I shivered in the cold, but everybody else seemed oblivious to it. Sommerberg specializes in western riding. I asked what the difference is between western and classic. The saddle is very different, I learned. With classic riding, the whole riding thing is very stiff. Western riding is more casual and relaxed. I mentioned another ranch I know, since I used to live near it. Oh, that is classic! In fact, that ranch is a bit elite. Nicole told me that she had visited that ranch, and she felt terribly nervous, out of place at this sophisticated location. Even the horses were tense, she said. Sommerberg is relaxed, everyone there emphasized. I asked if riding can change you. Can riding help you grow, or overcome problems! Oh, yes! they all said. Nicole said, "I can get away from my everyday life here, better than anywhere else. Here, I forget everything else in my life. Everything else seems less important. I'm in another world here, one where time slows down. And here, I live in the moment - not in the future or the past. In my 'normal' life, you can't do that so well. Our thoughts drift off into tomorrow or into that which is past, and then we can't enjoy the present moment. That's what I'm learning here. With a horse you can't pretend that you feel secure and at ease when you're insecure and tense. The horse knows when you're cheerful and in balance. A horse will mirror what you feel, whether you like it or not." One of the trainers told me about a woman they used to call "Bird" because she was as nervous and flitty as a bird. She was also as gray as a mouse, and people tended not to notice her. In time, she loosened up, but also became more defined, as she learned to be more assertive with the horse. After a few months, she began laughing and joking with the others. She started bringing cake for the other riders and the staff. I don't know that my one hour of riding changed me. They said I looked good, up on the horse. I did feel a little more comfortable petting the horses after being on Flasko for a while. I learned that riding is not a lonely thing, but a social gathering of warm-hearted people who want to be as earthy, as natural as possible. At least Western riders. Now if this is something Germany imported from America from their saddles, that makes me feel good. They imported me too. I have also hoped that some of my openness would rub off on Germans, who tend to be a bit stiff. One thing I know even deeper, after this experience. I want to shed whatever airs or falseness there still is in me. I have been created well, just like those horses, and I want to live in my true nature. This is what is gradually happening to Nicole. She is relaxing into more and more of herself, just by being around her horse and people who love nature and being natural.